As well as exhibiting their terracotta wares in the great Exhibitions of the 1862s and ‘60s, James Pulham and Son were also actively creating gardens for display at the Chelsea and Olympia Exhibitions during the early 1900s. 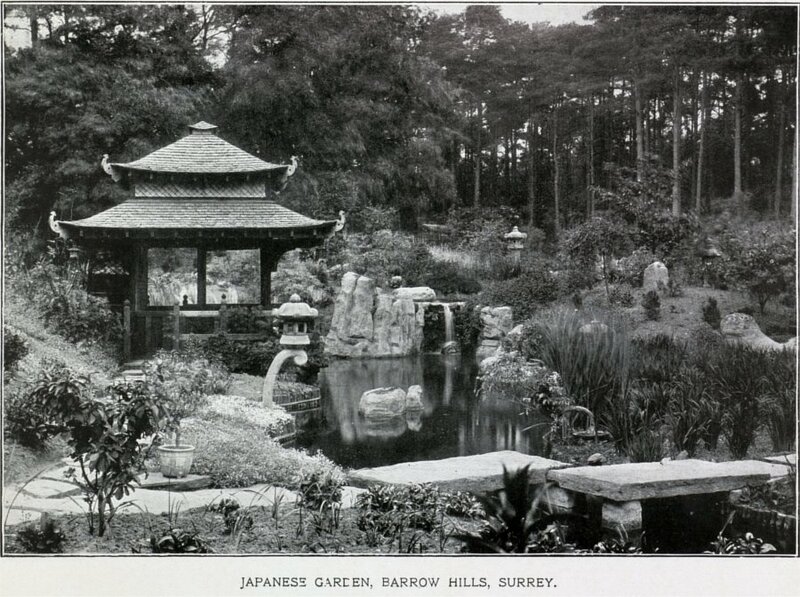 They built a lovely Japanese Garden for the Chelsea Exhibition in 1912, for instance, and that was later relocated to Barrow Hills, in Surrey, but no longer exists today. They also built a special garden in honour of HRH Princess Mary – later to become The Princess Royal, the only daughter of King George V and Queen Mary – at the Olympia Exhibition of 1923. They won their second Silver Cup for their garden at the Chelsea Exhibition in 1931 – the first being for their rock garden at RHS Garden Wisley, as described in Chapter 35. Both of these cups were later inherited by James 4’s grandson, Michael Goodchild, and spent many years in Zambia, but, thanks to this website, were eventually traced by the author, and are now back in this country at the Lowewood Museum, in Hoddesdon. This website is also responsible for the discovery of am incredible diary, the story of which is told in Chapter 44, and from which it was discovered that the Pulhams were responsible for the creation of a roof garden at Selfridges department store in Oxford Street, London, in 1914. A full description of the work done by James Pulham and Son at The London Exhibitions – together with a number of pictures – can be found in Chapter 36 of Rock Landscapes: The Pulham Legacy – the critically-acclaimed and lavishly illustrated definitive story of the lives and work of James Pulham and Son. Written by Claude Hitching, with featured photography by Jenny Lilly. Published by Garden Art Press. Posted on October 7, 2014 June 30, 2016 by Claude HitchingPosted in Book ContentsTagged . . James Pulham and Son, Chelsea Exhibition 1912, Claude Hitching, HRH Princess Mary's Garden - Chelsea Exhibition 1923, japanese garden, Lowewood Museum - Hoddesdon, Michael Goodchild, Rock Landscapes: The Pulham Legacy, Roof Garden - Selfridges Department Store.